The Amby Valley India Bridal Fashion Week 2013, kicked off for the first time ever in Delhi and we simply could not wait to step inside the glittering halls. The first day of the fashion week was inaugurated by showcasing a collection by the designer JJ Valaya, the renowned couturier whose name is synonymous with opulence, royalty, and rich cultural heritage of India, especially, when it comes to haute couture. JJ Valaya marked the beginning of this extravagant bridal week with his grand show, and as we scoured for seats and spots, we were amazed to find the whole ramp and stage decked up like a ship, as the collection was based on the theme, ‘The Maharaja of Madrid’ which is about a factitious voyage of a Monarch who was fascinated by the Spanish art, customs and forms. The whole set designed by schenographer Sumant Jayakrishnan, who made it extravagant and grand in every aspect. It was a visual treat for us, as we were mesmerized by the whole ambiance of this visual spectacle. Big white royal umbrellas were set, which depicted the scene of some king’s court, with models sitting on the thrones wearing white ensembles and chunky Indian jewellery, like kings and queens of the Mughal dynasty. The quintessentially royal and opulent element which was prevalent during the whole show has always been an integral part of Valaya’s shows. The show began with the music of birds chirping in the background, as we watched a male model playing a traditional trumpet like instrument, right in the middle of this opulent set. The dancers decked up in white sarees gave a beautiful Kathak dance performance, together in synchronization with another dancer, in a red evening gown, did a Spanish foot tapping dance, as it postulated a perfect mix of the Spanish and Indian culture. The specially crafted soundtrack for this particular performance was by Gaurav Raina of Medieval Punditz, and was indicative of the fusion of Indian and Spanish cultures, forming the essence of Vallaya’s Collection for this show. The collection is divided into 5 sub-inspirations and is an amalgamation of Spanish and Indian elements. He not only incorporated the spirit of history into his avant-garde creations with finesse but also made sure that the richness of his inspiration stays intact. As the models sashayed down the ramp in Valaya’s magnificient designs, we couldn’t control our gasps, as the grandeur of the Indian jewels was juxtaposed with beautiful ensembles like sarees, and long-collared ivory coats over sarees. The second part of the show was inspired by the Manton de Manila- huge fringed shawls of Spain. 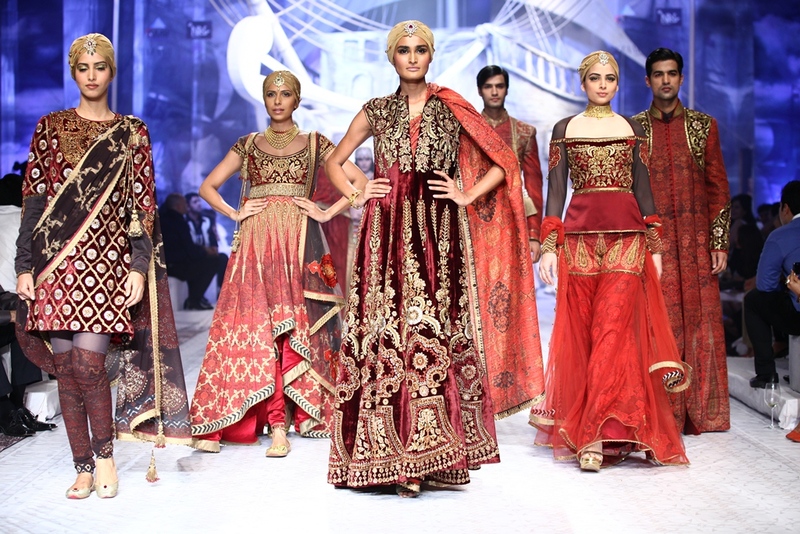 The collection showcased big floral prints in harmony with Indian Jamawar in paisley pattern. The blue tulle gown, whose top part of the ensemble was intricately embroidered in Jacquard pattern was truly eye capturing. Beautiful bolero jackets embroidered in similar fashion were also seen paired with the gown, giving the royal touch, to the whole ensemble. The big floral, jacquard embroidered lehengas inspired by Spanish tradition were beautifully blended with Indian attires. If we thought it couldn’t get better, we couldn’t have been more wrong. The third part of the collection was inspired by the murals of Mexican artist, Diego Rivera who started his career with a famous Spanish artist Eduardo Chicharro. His frescos combined with the unrivalled beauty of Indian miniature art formed the collection which was mainly in the hues of reds and blacks. Floor sweeping, long spaghetti strapped dress with a criss-cross back was truly awe-inspiring because of the intricate thread work. In men’s collection, sherwanis with bundgala were seen which were teamed with black straight fitted pants. All this while, Kala Rey from Gangs of Wasseypur played in the background, doing true justice to the whole showcase. The next section, inspired by the armors of Spain and India, showed wide array of collection in fine metal embroideries, velvets, tulles and georgettes. A deep maroon, velvet jacket with fine metal embroidery at the front, and in combination with wispy tulle fabric was a real stunner. The final collection was inspired by the bull fighters of Spain also known as Toreros. In men’s collection, long ankle length sherwanis in red and heavy gold zardosi work in gold and black captured the attention. Another was the georgette sari in red print with studded gold work and teamed with turban like head gear with a lavish beautiful broach studded in the middle of the turban. 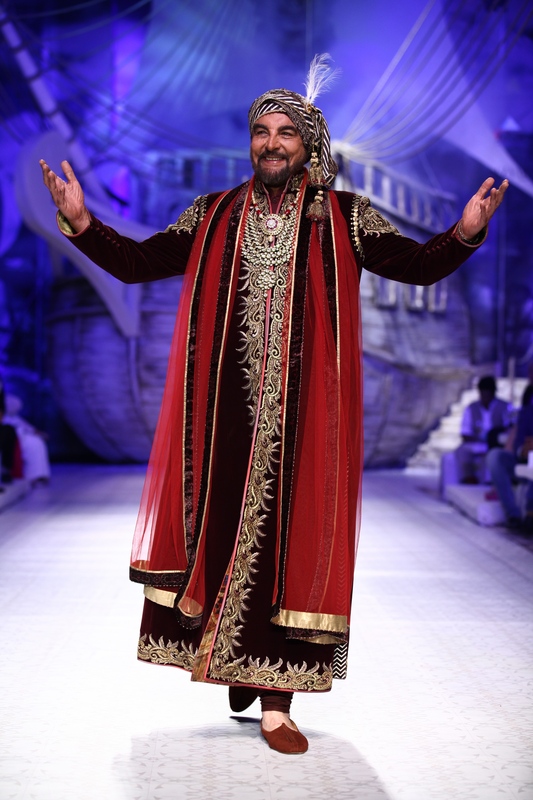 The crowd went wild as the showstopper, Kabir Bedi walked the ramp, in a royal, long, velvet sherwani with heavy intricate gold work all over, together with thread work at hems and borders. His majestic elegance further added to the outfit, and we could see why he was the showstopper. Along with him was the second showstopper of the evening, Kangana Ranaut, who looked absolutely gorgeous, in a floor sweeping lehenga in gold work, with the incorporation of paisley patterns, as JJ Valaya, the man of the moment walked arm in arm with the two of them. There couldn’t have been a better opening to a fashion show.